For many Danes, wielding a powerful gardening tool is as good as therapy – and not just for men. Women are increasingly investing in modern gardening tools and, thanks to its investment in research and development, Stihl has become the first choice of man. You do not have to be a six-foot-tall man to enjoy the power of a Stihl tool. The company aims not only to make its tools noise-free, safer and more environmentally friendly, but also to ensure that they can be handled by people of all sizes. “The first chainsaw made by Stihl, in 1926, weighed 50 kilogrammes and had to be handled by two people. Now, you can get a chainsaw powered by either battery or petrol that weighs as little as 2.8 kilogrammes,” explains Stihl’s Danish country manager, Michael Nielsen. 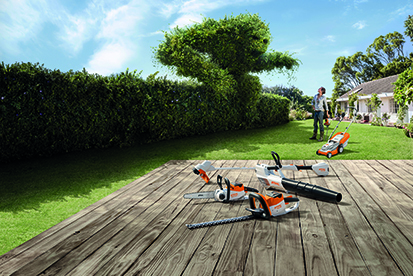 Today, Stihl’s range of garden tools and machinery comprises much more than just chainsaws. Hedge cutters, lawn mowers, grass trimmers and leaf blowers are just some of the Stihl products that can power up any job, whether in a professional or domestic setting. For many years, Stihl tools were mainly bought by professionals and middle-aged men. In recent years, however, the company’s new price categories, sizes, and functions have attracted a much broader customer base. “Traditionally many younger men have seen Stihl as an expensive, high-quality product and might have gone for cheaper solutions. But now, more are realising that with the shorter lifespan of cheaper products, a Stihl tool is actually better value in the long-term. We’ve also seen women come onto the market. I think it’s because more women live and manage on their own and so they’re investing in a small hedge cutter, trimmer or chainsaw,” Nielsen explains. “It’s something we’ve taken into consideration in our product development by, for instance, ensuring that our trimmers can be adjusted to people of different heights.” For novice gardeners, buying Stihl tools also has the advantage that all traders are trained not only in guiding customers to make the best purchase, but also in demonstrating how to use the tool as safely and efficiently as possible. So even complete beginners can take home a Stihl tool with the confidence that it will not be living a secret life in the shed. Battery-driven tools are not the only invention making gardening a more pleasant experience. Garden robots and digitalised tools are also increasingly improving — or even removing — troublesome elements of gardening work. “We see digitalisation as a very important part of our future, and we’re already well on our way to developing a range of tools that will, via the user’s phone, be able to give information on when they need repairs, the user’s technique, how much power they’ve used, and where the tool is. That’s something that will be hugely beneficial to our professional users,” Nielsen stresses. One of the most popular new developments for the domestic market is the iMov lawn mover. “Right now it’s the robot lawn mower, but more products are on their way, such as watering systems, for instance, that will test the need for water and distribute it where it’s needed,” says Nielsen. “In other words, in the future, we will be able to provide people with tools that will not just ease the physical side of the job, but also help to intelligently plan it ”.